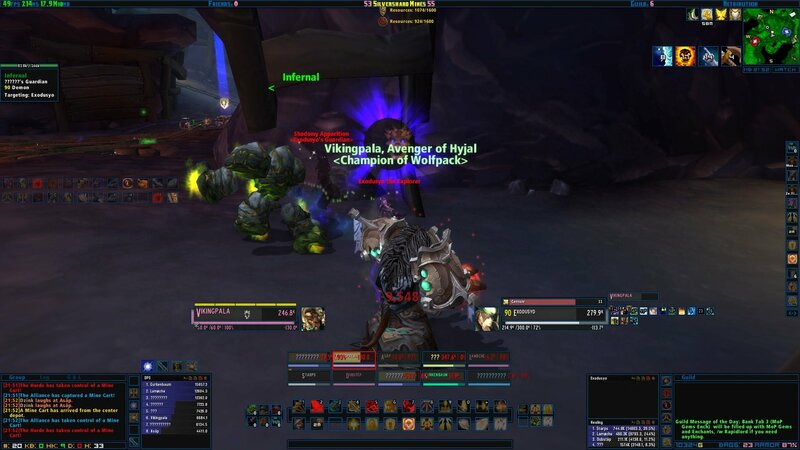 ViksUI is a fully functional UI replacement for WOW with many extra features that are not included in the standard UI. Almost everything can easy be changed ingame. Panels and borders can be changed color on, or turn off. 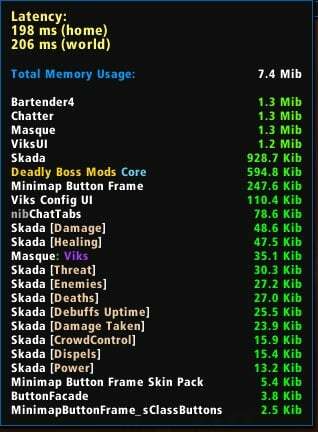 ViksUI is NOT a "addon collection"
It have it's own oUF layout for unitframes. The unitframe changes based on raidsize. This UI is tweaked for 1920x1080. This UI started along time ago, and was just shared with friends at start. Much of this UI have found code and inspiration from different UI like Quilight UI, ShestakUI, TukUI, DuffedUI and ElvUI. So credit goes to all of these UI. The UI is based on my likings so it will not change alot, but i try to add options to change most. Like turning off panels, change colors and fonts. Combat text - xCT integrated into UI. Cooldown Flash - Flash icon when Spell is ready after use. Enemy cooldowns - Track enemys cd in BG or arena. Error options - Filters away some error messages. Loot and Roll Frames - Custom frames with automation options like AutoGreed/Disenchant Green items. Raid cooldowns - Tracks raid players CD. Left click to announce and right click to remove. Pulse cooldowns - Pulsate spell icon when cd is over. unitframes - oUF unitframes with most needed information and good overview. minimap - Custom minimap with quick menu (yellow icon) and right click menu. XPBar - Custom XP bar with extended information detail. Chat - Fully adapted and tweaked chat. World Boss kill tracker - Track what world bosses your char have killed this week when mouseover the clock under minimap. Skins - Skinning of Blizzard frames and many other. NB! Keep using the Addon skins over this! Quest automation: Gossip Skip, Auto Accept, Turnins. Shift Click to override. Mage Portals: Left click for Teleport, Right Click for Portal. Raid Utility: Left Click for Menu, Right Click for Ready Check, Middle click for Rolecheck. One click DE/Milling/Prospecting by holding Alt button in and click on item. /cfg - Open interface settings. /ui - Moving interface elements. /gm - Open gm frame. /role - Check party/raid roles. /rd - Disband party or raid. /convert - Convert to party or raid. /uihelp - Description of commands. /resetui - Resetting general settings to default. /resetuf - Resetting unit frames positions to default. /resetconfig - Reset ViksUI_Config settings. /resetstats - Resetting statistics of gold and time spent. /settings msbt - Type /settings msbt, to apply the settings MSBT. /settings dbm - Type /settings dbm, to apply the settings DBM. /settings chat - Type /settings chat, to apply the settings for chat. /settings cvar - Type /settings cvar, to apply the game settings. /settings bartender - Type /settings bartender, to apply the settings Bartender (Must reselect profiles after). /settings all - Type /settings all, to apply the settings for all modifications. /litestats - Help for LiteStats. /dbmtest - DBM test mode. /raidcd - Raid cooldowns test. /xct - Manage combat text. /tach - Test Blizzard's announce window. /teb - Test and move Blizzard Extra Action Button. /testroll - Test group roll. /ss - Switching talent spec. /farmmode or /fm - Increases the minimap. /align - Grid alignment interface. 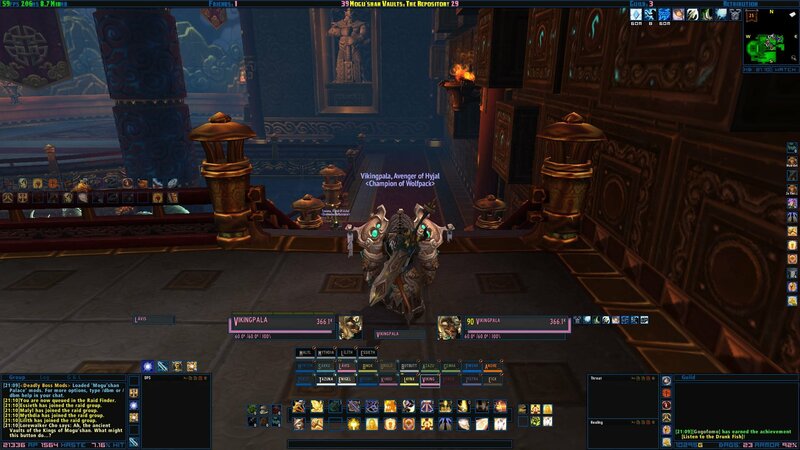 Copy all from archive to your World of Warcraft folder(Interface\AddOns\). For first time install pr wow account setup. Click “Accept” on First tim on ViksUI. Click “Accept” on DBM Settings (if installed). By default skinning off DBM is enabled. 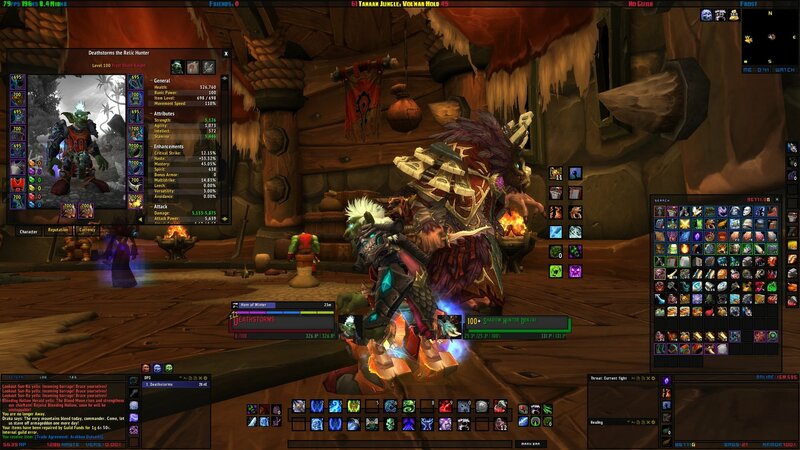 Tip for WoD: The Garrison special ability button, drag the button to action bar to remove texture! Not installed correctly and/or had it previously installed. These errors normaly comes when not cleaning fully up before upgrading to Version 5. Updating to V5 - See Setup! ONLY WORK ON PATCH 6/WoDFrom Version 5.03 Masque_Viks is no longer needed. So delete the folder if had previous install of addon. Simple Movie Showing the simple basic for firsttimers. YouTube Vid: Showing different stuff in UI (Old). Look through the “/config” for more settings. Ctrl+Alt+Shift + Mouse click on target/raid frame to set/clear focus. 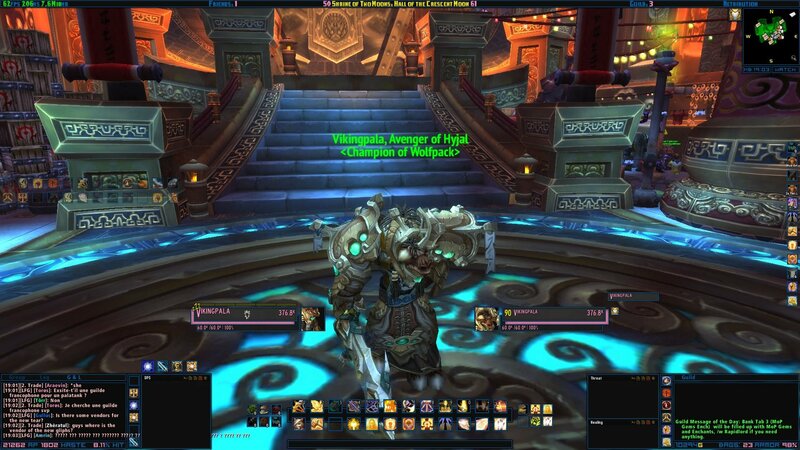 Qulight UI for the addon pack thats inspired from Tukz again. oUF_Karma MOP inspired the Font, Rest/Combat icon. NEW PATREON: Wiggy - Huge Thanks for the support! • Fixed combo points message for CombatText. 6 years with hundreds of hours on coding and countless hours with support for free! and countless hours with support for free! Not a cent donated so far.. I have made Discord channel for quick questions regarding ui. I have also started streamin on Twitch. If all could join/follow there it would be awesome. * Added some small stuff like ilvl inbags. * Added Seals pr Week to "Time tooltip"
* Updated currency to show under "Gold datatext tooltip"
* Made Tooltip movable again and added corners to anchor from. NOTE! Rember to delete \AddOns\Masque_Viks folder. It's no longer needed. * Disable Achivment popup frame due to errors for now. * Showing Quest Level in worldmap again. * Big rework for errors and WoD. Works only on patch 6 and WoD (Beta). * Fixed Burning Ember bar. Should show 4 embers now. * Moved Classtimer above Orb bar for Priest. * Fixed ScenarioFrame showing behind minimap. * Made WatchFrame non movable again, but repositioned it better. 4.32 - Fixed Error in itemlevelslot in inspect frame and fixed character frame to show correct quality color. 4.3 - Update after long breake... Minor fixes. 4.22 - Fixed game menu and skinned store button. 4.21 - Fixed Realmname shwoing on guild tab and few other minor fixes/changes. 4.2 - Many small fixes. Added shop and loottoggle on minimenu. Fixed some skinning errors. 4.14 - Fixed Friend list (datatext) and some minor fixes. 4.13 - Fixed Autoinvite. Minor other changes. 4.12 - Fixed errors, cleaned up combatlog and other minor tweaks. Disabled Autoinvite untill error have been found. 4.11 - Fixed error in move function (/ui), cleaned up and remade Petbattle frame some also few minor typos/errors. 4.1 - Fixed various skins. Updated spell info and raid debuff. Fixed:bags, healericon, ClickCast, Combattext and few other stuff. - Improved bag/bank. Changed style and refreshed it some. Remember "right click" x button in bag for sorting/stack. - Improved and fixed Chat. - Added styling of chattbubbles. -Fixed Buff error for Shamman. 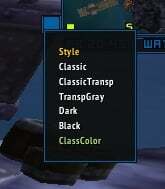 - Changed a few Default values, recomend reset ingame. Added loot & Lootroll window again. And smaller changes. Fixed Monk Chi bar and updated addons + minor bug fixes. Minor error fix in Datatext; Friend and Gold. Changed small errors from MOP. Buff for shammys, Heal indicator for monks and other reported errors. Updated Raid Debuffs, Filger, ClassTimer, ToolTip and few other. 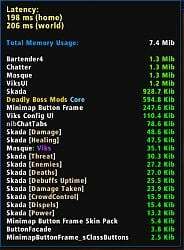 Sugest deleting Interface\AddOns\ViksUI folder before extracting due to some files have been removed. Big changes to raid frames and layouts. Including icons, indicators, debuffs, positions and much more. 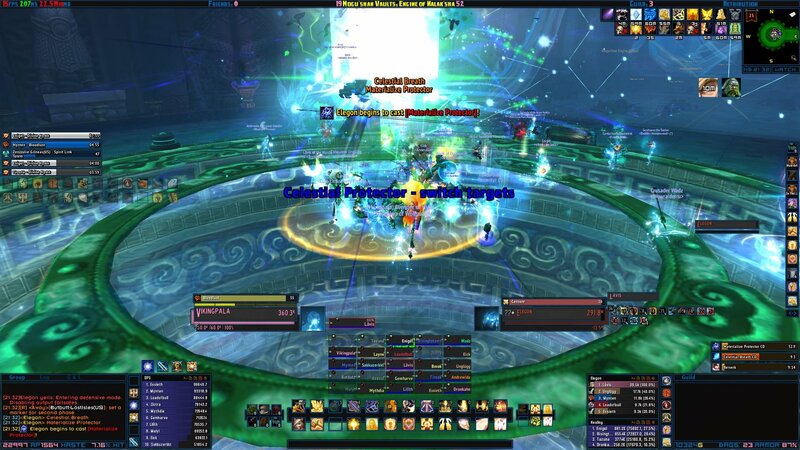 Reenabled Indicators, Auras and Debuffs to raid frames. Added option to select 2 different Indicators, Auras and Debuffs style. 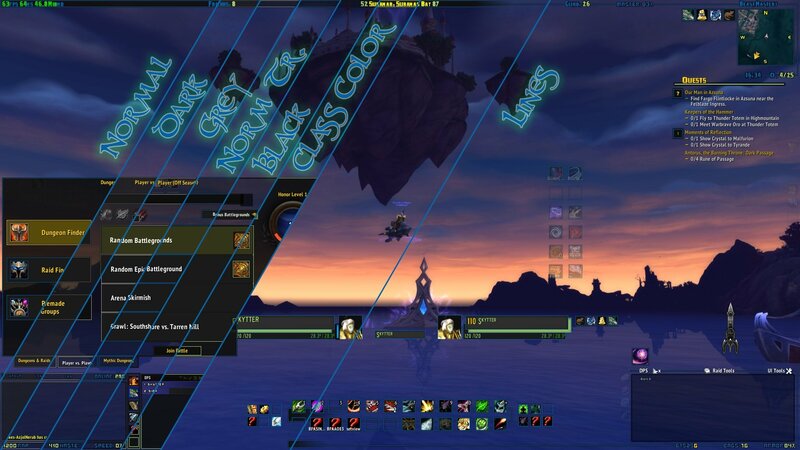 Added raid frames layout based on size for both type of raidframes. And some other small changes. UPDATING FROM 1-91 - Delete current ViksUI folder then extract this version. * Enabled Buff reminder on Raid Frames. * Fixed Buff/Debuff errors on raid frames for few classes. * 1-6 - Fixed/changed Anchoring on Tooltip. Added extra xp/rep bar at bottom. 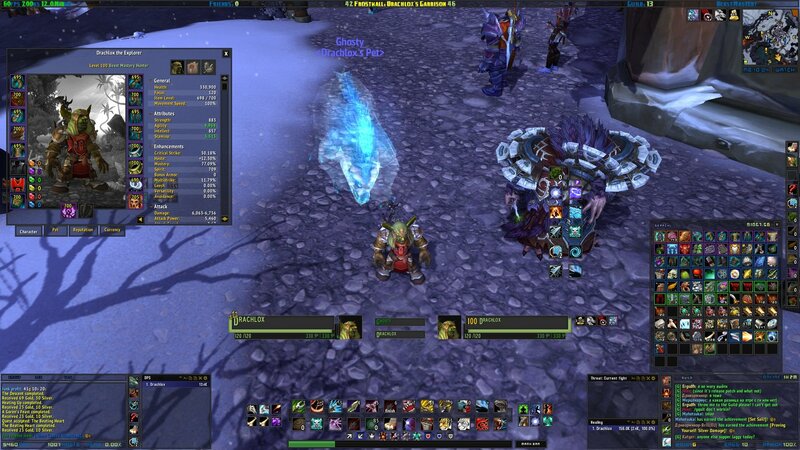 * 1-5 - Added Aurawatch, Debuff display and indicators for tracking spells/hot's on Raid Frames. Reenabled Filger (No spells yet). Fixed XP/Rep Bar. Added option to hide panels. * 1-3 - Updated for Live Server (5.0.4). Added more options for minimap. * B1-2 - Added picomenu to minimap and also fixed trackingmenu. * B1-1 - Big fix: Clean up on code, fixed few errors. As i can't keep track on all pages i have decided to move all support to discord channel! 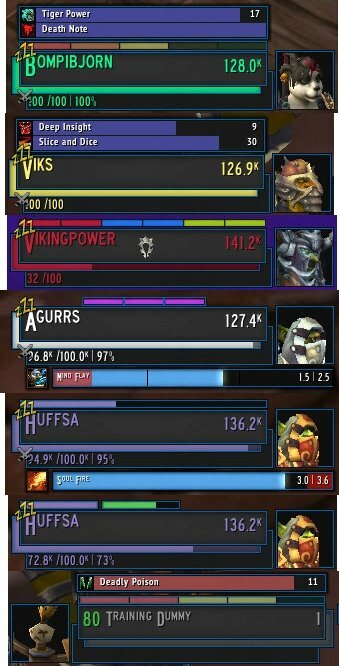 Re: how to modify the buff timers above the player unit frame? 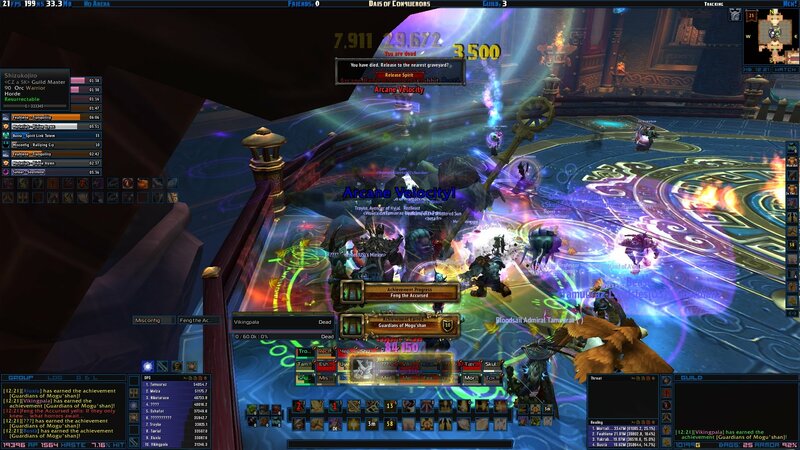 Hi love the UI, How can I add the Discipline priest buff Atonement to the Buff timer above the player unit frame and maybe make it visible when healing a party or raid on other players? Atonement should already be visible. In the top right corner on raid frames it shows. Are you thinking about on classtimer? The bar above player/target frames? I love your ui, its neat, clean and functional. i have to ask though how do i access the mini map tracking features (find herbs, traders, mailbox) etc. how to modify the buff timers above the player unit frame? first of all, i'm using you interface for a while now - thanks for that. Mind to take on look on Unstable Affliction and Dot Timers? (*temporary) = "attempt to index local 'texture' (a number value)"
I have no use for them but when I look into your ui options, I don't see a way to remove them. /bt -> Then disable the bars you don't like/need. Hey Vik, got a quick question here, I am noticing that I can no longer change the font in the various skada windows, I like pixel fonts but the smaller ones are too hard for me to read so I usually change them to something easier, is that little pixel font now hard-coded somehow? and i must say a awesome ui you have made. have only 1 question is it possible to remove the bar i have marked? 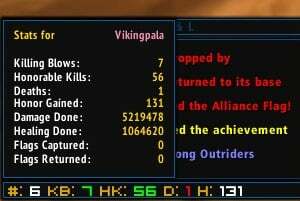 What action bar addon are you using? And thats no settings that removes it. You can run " /run CPMAB:SetAlpha(0) " to hide it, but you will have todo it every time you load wow. I often keep subscription to wow purely to be able to update this addon.